The best car horn is one of those items you may not give that much thought to when you’re upgrading or servicing your vehicle, but they are actually a crucial safety device that may just save your life. Imagine you’re driving down the interstate with your little ones in the back. A large truck pulls across your lane and doesn’t see you because through no fault of your own they can’t see you. What are you to do? That is where your best car horn comes into its own; by being able to instantly and effectively alert the driver to your presence. So, what is the best car horn money can buy? PIAA has a long and storied history in the horn market, and with good reason. So, how does their latest offering stack up against the competition, and is it really worth a look as you go in search of the best car horn money can buy? With a name like the Superior Bass Horn, you’re expecting some real deafening sound at your disposal for when you need it most, and I don’t think that you’ll be disappointed! To start with, I really liked the bass of the overall sound. When you’re driving a high pitched sound won’t necessarily stand out from the background noise, or carry as far. Armed with a stunning 112dB of bass you’ll be able to attract attention and alert other drivers when other horns just won’t do the job. Perfect for the peace of mind that you have everything covered to drive safely on the busiest highways and in the most demanding of weather conditions. PIAA has set the 85115 up so that it can work at either 330 or 400 Hz which gives you an added layer of flexibility that I think you’ll love. By being able to change the frequency to suit your needs and personal tastes you can be sure of making a welcome addition to your vehicle that will last for years to come. When you add to that PIAA’s well-known reliability and durability, you’re onto a winner that will last and last, as long as you need. Perfect for knowing that no matter when the last time you sounded your horn, it will be there when you really need it! 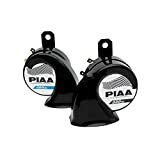 With everything backed up by a Limited Lifetime Warranty, it goes without saying that PIAA is putting their name to something that they’re rightly very proud to call their own. PIAA pride themselves on the ease of their installations. After all, it’s no use selling a mid-range priced product if it proves too complicated and overwhelming that your customers. They don’t want people to pay out more than the value of their new purchase on paying a professional to fit and adjust it for them! With no rewiring or relays needs, the 85115 is the perfect addition that you can make in minutes before your weekend drive into the country. I really like that it is set up in this way as it shows the attention to detail that has been paid, to the little things. This gave me the confidence right away that I was using something that was built to last. The latest offering from PIAA does exactly what it says: deep attention-grabbing bass and easy to modify the two-tone sound. 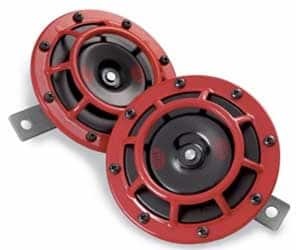 What I particularly like is that it can readily achieve the stated 112 dB — certainly loud enough to use on any road and in any weather conditions. There are however a couple of small questions regarding ease of installation and reliability raised by some recent buyers online that you would be wise to take a closer look at just in case. 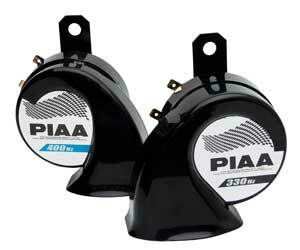 However, as it is backed by a Limited Lifetime Warranty it’s hard to see how you can go wrong with PIAA: highly recommended. HELLA should always be your first port of call when it comes to finding the best car horn on the market. With over 100 years of innovation and engineering excellence, they really have mastered the art of combining uncompromising performance with indisputable value for money. Let’s take a closer look at their most popular offering and see what you get for your money. The first thing to say about the HELLA Supertone is that it does exactly what you would expect. The tone is true and clear, and easily audible to other drivers on the busiest of highways and interstates. That’s the key functional requirement ticked off, so how about the rest? Ease of installation is somewhere many similarly priced products fall down. It’s no good getting what looks like excellent value for money if it takes so long to fit that you end up having to take it to a professional. Or spending more than the cost of the horn on some never to be used again specialist tool. What HELLA have done better than anyone in this respect is keep things simple. 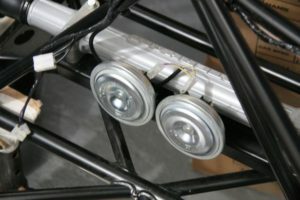 The wiring can be done in a couple of minutes and requires just a single mounting screw and a couple of easy to adjust blade terminals. Perfect for spending more of your time actually on the road! The next thing to mention is the adaptability of the system. While you can fit a single horn with fantastic results, you have the option to install a pair. By setting one to operate at a high tone, and the other at a much lower frequency, you can create a highly effective and audible sound that will instantly alert other road users to your presence. When you add to that the enhanced power and size of the electric drive that HELLA use as a standard, then you have an unbeatable package that will work in even the most demanding of driving conditions. Perfect for when the snow starts falling, and you still have a way to go before you reach home. Hard to fault this offering from HELLA, so I’m leaving this blank! All-in-all, the HELLA Supertone, offers easy installation, a highly effective and adaptable sound, and proven technology that you can rely on in any weather. When you add to that the fact that HELLA offer it to you at the highly competitive price, you’re onto a winner from day one. Supertone horns come with a M8 screw horn bracket and with flat connections of 6.3 mm, open, blade type. 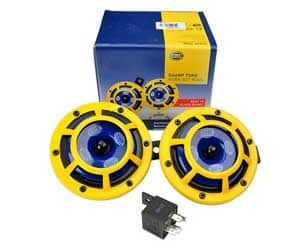 High tone: 500 Hz - Low tone: 300 Hz - Sound level: 118 dB(A) - Voltage: 12Volts. ECE-R28 approved. Application: UNIVERSAL; Kit includes 1 high-tone Supertone horn, 1 low-tone Supertone horn, 1 12V relay, 2 mounting brackets, and mounting instructions. Perhaps unsurprisingly for those of you who have already studied the major players in the market, we have a second entry from the experts at HELLA. It comes in the shape of the Sharptone, and comparing it to the slightly more expensive Supertone that we’ve already looked at in detail above certainly makes for interesting reading! The first thing to say about the Sharptone is that I fell in love with the price instantly. For a great price you’re getting a world-class brand name for little more than the price of a couple of burgers and sodas that you’d pick up at the end of your Sunday drive. The question is then, does the low price come at a cost? Or are you still getting the quality and reliability that comes as standard with the HELLA name? I’m going to cut straight to the chase and say that HELLA have delivered here once again. The fact they’ve been able to come up with something even more affordable than the Supertone without sacrificing the quality of the end product makes this achievement all the more impressive in my honest opinion. The Sharptone is known as a great value compact option, and it certainly delivers an attention-grabbing sound that will be there when you need it in times of danger or emergency. The tone is a little deeper than the Supertone, and it really resonates and carries. This makes it a great option for busy high-speed interstates where you really need some bass to be able to alert other drivers to your presence effectively. Ok, so the install isn’t strictly instantaneous, not even HELLA have managed that (yet). But the instructions and minimal wiring requirements make the Sharptone the next best thing. The package comes securely boxed and packaged so you can see at a glance all of the pieces you need. There’s no requirement to spend more than the set on a specialist one-use tool which is another plus. Once you have everything out of the box, you’ll find the instructions refreshingly succinct and to the point. Often with kits deciphering the instructions can be half the battle, but as always with HELLA you’re opting for a brand name that knows how to keep things simple when they need to be. I find it really hard to walk past anything that has HELLA written on it. When you know the market, you’ll see it standout as a mark of quality that is hard to beat, and the Sharptone is no exception. Furthermore, as such a great budget offering this product easily competes with the mid-range priced kits. That makes it a fantastic choice for drivers who want something that does what it is supposed to without them having to spend and spend. Highly recommended: fantastic value for money and simple to install. HELLA's ultra reliable loud and powerful Dual Sharptone Horns look and sound like nothing else on the road. These horns guarantee the attention needed in every situation. Coming with a Black Coated Metal body with a Yellow Protective Grille for a distinctive and stylish look, these horns are for the performance oriented driver for a high level of safety combined with great design and high quality. HELLA Sharptone horns guarantee best functionality, optimum fit and long lasting customer satisfaction. Sharptone horns come with a M8 screw horn bracket and with flat connections of 6.3 mm, open, blade type. High tone: 415 Hz - Low tone: 350 Hz - Sound level: 115 dB(A) - Voltage: 12Volts. ECE-R28 approved. Application: UNIVERSAL; Kit includes 1 high-tone Sharptone horn, 1 low-tone Sharptone horn, 2 mounting brackets, relay and mounting instructions. 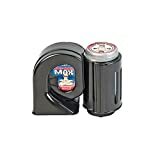 With a name like the Big Bad Max, it’s almost impossible to walk past this latest offering from Wolo when trying to find the best car horn on the market. A well-known brand and an attractive name are one thing, but functionality and performance can be something else entirely. So, is this something you need to add to cart today? Or is it a victory for marketing over engineering? Let’s take a closer look and delve into those all-important details. The first thing to say is that we’re looking at a mid-priced horn that is big on promises. By boldly declaring that it is twice as loud as a factory horn it is certainly setting itself up in the frontline performance-wise, so how did it get on when I put it through its paces? I really like that I could see how to install it straight out of the box. The package is nicely finished and an all-in-one design that encompasses the horn, wiring, and in-built compressor. This made mounting it rather simply as I didn’t have to worry about finding space for multiple smaller parts on my vehicle. I must also say that getting to look at the Big Bad Max branding while I was bolting it on was a definite plus point too! Highly Dependable but Is It Twice as Loud? Wolo certainly knows what they’re doing when it comes to creating products that will stand the test of time. They test and test until they get the design just right, and then you are left with something that will last for years. That said, there is a little dispute online as to whether they can actually claim they’re twice as loud as a factory horn. For me personally, I found this a difficult claim to accurately assess as I didn’t know the dB of the horn that they were comparing it to. While it sounded certainly loud enough to alert other drivers to your presence on even the busiest of routes, I wasn’t convinced it was double dB of some of the other horns on this list. I may be being ultra-critical here as it is undoubtedly a durable and usable horn. But I think just clarifying the spec with a dB value would be a way that will avoid some buyers experiencing disappointment after they sound it for the first time. Wolo knows precisely how to create buzz around their products, and naming their latest entry into the market. 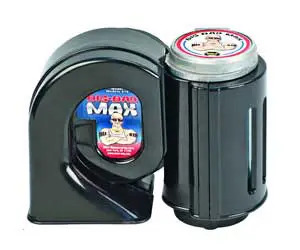 The Big Bad Max is a testament to their ability to get heads turning in their direction. With the stamp of approval that only an established name can provide, this is a great mid-range option that won’t disappoint. My only criticism would be that it may be worth a closer look for those who are looking for the loudest sound on the market. Recommended: a solid offering from an established name. For those of you, that love the retro or throwback style this offering from mAuto is indeed worth a closer look as you search for the best car horn on the market. Made with care by masters of their craft in Italy, it comes with that authentic touch that I really appreciated during the unboxing experience. Weighing in on the far side of 13 lbs I was initially surprised by the net weight of the delivery. But, then to my delight, I saw that it included all of the fixtures and fittings needed. Plus, the air compressors and related parts. That made an instant good impression as it meant I wouldn’t have to shop around in search of compatible parts. With a 13-inch and a 15-inch horn supplied as standard, you have everything you need to provide the loud continuous sound that you have been looking for. With each backed by their own compressor channel you may think that there is a substantial amount of installation needed, but as with everything with mAuto, they keep things simple when they need to be. The instructions are to the point and clear, offering simple to apply advice so that you understand not only what you’re doing, but also why you’re being asked to do it. This is especially important when it comes to mounting the horns and compressor. By pointing out that the horns need to face downwards to avoid collecting water, and that the compressor needs a proper airflow to stay cool, mAuto give you the key pieces of information without overwhelming you. This is a great way to give you the confidence that you’re setting up everything right so that you don’t end up googling something insanely specific like how to fit this type of horn to your exact make and model of vehicle. mAuto are paying homage to the old country with authentic craftsmanship and a gorgeous chrome finish. That makes it an excellent choice for drivers who’re looking for something a little different. Something that will add an eye-catching feature, as well as a reliable additional piece of functionality to your vehicle. What I really loved was how versatile the mounting fixtures were. This gave me the option to trial the horns in different positions, to find the right look as much as anything! By providing that little bit of customization, mAuto have really gone the extra mile to make sure that you’re happy with your final purchase. mAuto have really done something special if what you’re looking for is a horn that also becomes a feature on the front of your vehicle. I would say that whilst the sound is amazing and the installation very easy, the classic look does make this a slight niche product as it won’t be in keeping with the style of more contemporary vehicles. That said, if what you’re looking for is a throwback then you certainly cannot go wrong by adding one of these to your vehicle. What’s more, it’s also backed by a money back guarantee — perfect for the peace of mind that you’re spending your hard earned money on something that will do everything you need it to and stand the test of time! Strongly recommended for buyers who have a particular throwback style in mind. 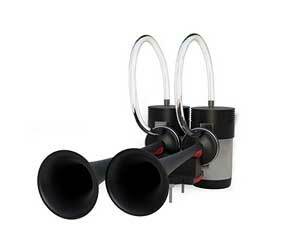 ✓ POWERFUL SOUND - The mAuto loud air horn produces one very loud simultaneous sounds. If your goal is to make sure people know you are coming their way then this train horn is what you need. You will get a powerful diesel sound that will make sure others get out of your way. 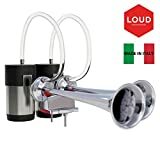 ✓ DUAL HORNS - This air horn has dual horns which measure 13" and 15" as well as dual heavy duty air compressors to produce that long and loud continuous sound. ✓ EASY INSTALLATION - No need to worry about buying hardware or relays for installation, it's all included for you to install as soon as the horn arrives. Works great with cars, trucks and SUV's. ✓ CUSTOMER SATISFACTION GUARANTEE: You can shop with confidence knowing all our products are backed with a 30 Day 100% Customer Satisfaction Guarantee. If you are not happy with the product for any reason just let us know and we will be more than happy to issue you a refund. So there you have it, five of the best for you to take a closer look at. Also, though, I’ve put together a handy buyer’s guide that you can refer to whenever you want. It will assist you when you go in search of the perfect horn for, your vehicle. How do you choose the perfect sound? I’m worried about compatibility, what should I do? I’m new to this, why do I need a compressor? Electric? I thought they operated on air? Why are some horns dual tone? Where should I look for further advice? That is quite a personal choice and ultimately depends on what you feel comfortable with. I always recommend listening to sound samples, or even better; hearing each horn on your shortlist in person if at all possible. Once you find the right choice you will know it, so feel free to shop around and don’t feel that you have to follow the crowd on this one. This can be something that catches a few new buyers out, but don’t worry as there is plenty of help and advice out there. The main thing to make sure of is that you have easy access to a 12V-line as most kits will need this to run. If you are buying a kit with a larger compressor, then it is also worth surveying your vehicle to ensure that you meet the necessary free space requirements. Remember that compressors are working hard to maintain the all-important air pressure that your horn needs. This means they need plenty of airflow and breathing space to remain cool. If in doubt, consult the manufacturer. Your horn works by driving a massive volume air out very fast, this creates the high volume that we all know and love. To make that possible an air compressor is needed. By squeezing air into a small space to generate a high pressure, it will create the build-up of air that your horn needs to operate. If this is not an area you’re too familiar with don’t worry; every reputable manufacturer will sell a compressor as part of their kit. Perfect for giving you the peace of mind that you have everything covered. Your horn drives air, but in the vast majority of cases will be driven by a small electricity supply. You can think of an electric horn as similar to the speakers on your old hi-fi. Just like a horn they had a diaphragm that moved rapidly backward and forwards at a particular frequency. Change the frequency, and you change the tone of the sound. Change the amount the diaphragm oscillates, and you adjust the volume. Simple when you know how right? Tell Me About Direct Air Horns. The direct air horn is a classic solution to alerting other vehicles to your presence. Rather than their more common modern electric counterparts, the direct air horns on the market rely on a large compressor and a metal horn. The air is driven rapidly through the horn, kind of like a trumpet, and the tone of the sound is largely governed by the size of the horn. This is mostly a matter of flexibility. With a safety device like a car, horn manufacturers know that it is essential that drivers feel confident in their latest purchase. By offering two distinct tones, they are giving you the freedom and flexibility to find a sound that is effective for your particular driving conditions. Perfect for the peace of mind that you will be able to alert other drivers instantly when you need to! Much like your road vehicle, trains need to be able to alert other vehicles to their presence. A train horn is a powerful horn that is typically operated from the air supply used for the braking system. By mounting horns in anything from pairs to batches of five, trains are able to create chords by playing a range of notes simultaneously. 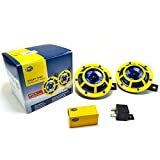 This helps other vehicles to distinguish their sound and make them easily noticed amongst a variety of different background noises. There are a number of additional places you could look for advice. Online stores and discussion boards are good places to go to sample customer reviews. These will give you a broad overview of how a large number of buyers found their purchase. This can be a great way of identifying recurring problems, such as faulty relays or horns that die inside 12 months, with certain makes or models. The other place I always recommend buyers head to is their local garage or store. By being able to speak one on one for a couple of minutes with someone in the know you can often save yourself hours by getting a quick run through of everything you need to know. In fact, that was my inspiration for writing this buyer’s guide! So there we have it, five car horns for you to cast your eye over, with a buyer’s guide added in the end to finish things off. No matter what you decide to add to your vehicle the one key point of advice I want you to take away with you is that your horn is at the end of the day a safety device. Always think first and foremost about whether it will alert other drivers to your presence.